Students and professors rallied across Brazil, following police raids at more than two dozen public universities. The unprecedented raids came after electoral authorities ordered #EleNao and anti-fascist banners be taken down from university buildings. They claimed the materials were partisan and steered in favor of the Workers Party candidate Fernando Haddad. According to the Folha de Sao Paulo newspaper, police had search warrants at some universities. Electoral authorities also barred an event In Rio Grande do Sul, called “Against Fascism. For Democracy”, claiming it would be a campaign rally inside a government-funded institution. In Brasilia, students responded to the raids, by performing Bela Ciao, an Italian folk song that was adopted as an anthem of the anti-fascist resistance during World War II. The far right former military captain and presidential candidate Jair Bolsonaro is leading the polls ahead of Sunday’s elections. He has praised torture and Brazil’s military dictatorship, which ran from 1964 through 1985, during which thousands were tortured and hundreds killed. Students fear Bolsonaro’s election could mean a return to Brazil’s dark past. They believe that as president he will sweep in a wave of repression and censorship, while rolling back rights and attacking traditional marginalized communities and political opponents. Last week, Bolsonaro threatened Brazil’s left, during a live statement televised to supporters in Sao Paulo. Earlier in the week, students at the Santa Catarina Federal University were ordered to take down their #EleNao banner. 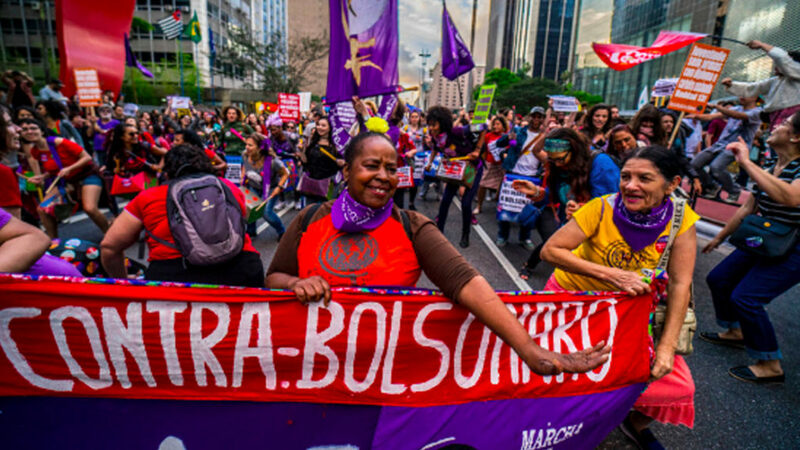 #EleNao, or #NotHim has become the hashtag of the movement against Bolsonaro’s candidacy. The students walked the banner around the school and took pictures of it hanging from numerous departments. The students are mobilizing for the vote on Sunday, but regardless of the outcome, they have promised to keep the pressure on.